On 11 August 2015, it was announced that Fernandez signed a one-year deal with Australian A-League side Perth Glory. It is the first club of Fernandez abroad. In January 2016 he returned home terminating his contract. 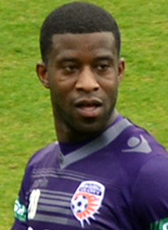 Fernandez arrived in Perth in September and played five Hyundai A-League games for Glory, scoring one goal. In April 2016 Fernandez signed a contract at Stal Dniprozherdynsk. At this club from the Ukraine Premyer Liga, Fernandez met fellow Dutchmen, Erik van der Meer the manager of the Ukrainian club. At the end of the season he was released from his contract. After a successful trial period, Fernandez returned to his former club ADO Den Haag in January to sign for the rest of the 2016-17 season. In August 2015, he was called up by Patrick Kluivert for the Curaçao national football team for the first time, for the squad for the two World Cup qualification matches against El Salvador.